Frequently asked questions (FAQ) about orders placed with Name Your Discount, which provides great saving with a few tradeoffs. Who is purchasing my Amazon orders? Earners with excess Amazon gift cards purchase items on Amazon in exchange for Bitcoin. Many people with excess Amazon credit are looking to liquidate that value into a more usable currency. These Earners are willing to trade their Amazon gift cards for below the USD value of the gift card. This value is passed along as savings to you. Once you confirm that you've received the items, our secure escrow system releases Bitcoin to the Earner. What is the difference between Buy Now and Name Your Discount? Buy Now is an instant 5% savings and best used for purchasing items you wish to receive as fast as possible. Purse manages these orders, which are purchased by VIP Earners w/ Prime. This means that most Prime-eligible items will deliver in 2-3 days. The escrow rate is also locked on once you fund your order. 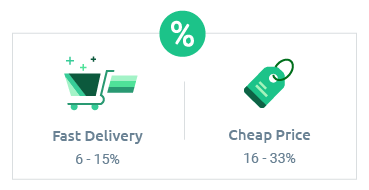 With Name Your Discount, you may set your discount between 6% and 33%. The higher the discount, the longer you may have to wait for an Earner to pick up, so it is best used for items you'd like to save big on. How do I choose the discount rate for Name Your Discount? Selecting the discount amount is up to you. Lower discounts result in faster order fulfillment while higher discounts will require you to be extra patient. The most common discount rate is between 15 to 18%, so that would be a good place to start. Do I have to use a Wish List for Name Your Discount? An Amazon Wish List is no longer needed to purchase from Amazon.com. Simply log in to Purse and search for the item you want to buy. Go through the checkout process to select the discount for your items. A Wish List will still be needed if you are planning to use Purse with another Amazon store such as UK or JP. How long do I have to wait for an Earner to accept my NYD order? Once you place your Name Your Discount order it will remain on the order books until an Earner decides to accept and purchase. The waiting time depends on the discount you select. For items you wish to receive more quickly, a lower discount is suggested. What happens if no Earners accept my Name Your Discount order? Orders will remain listed on the order books until an Earner decides to accept it. If your order is not selected by an Earner as quickly as you’d like, try reducing the discount and re-submitting. What happens if there is a problem with my Discount? If you encounter any problems you can reach us on Purse.io by using customer support chat (Click on Contact under your Profile), or by contacting us via email: [email protected]. There is no catch. Read our post about how the Amazon gift card market enables these amazing discounts.